This post isn’t even remotely about cloud computing — instead it’s about a very worthwhile, and slightly insane, charity mission currently being undertaken by our Business Development Consultant, Paul Gwyther. Sadly, last year, Paul’s father died of cancer. Paul and his family were so touched by the care given by the staff at St Ann’s Hospice in Manchester that they decided to raise money for the hospice. 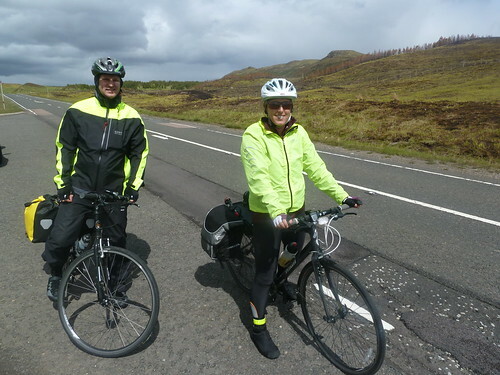 So Paul and his sister Lucy are currently cycling all the way from John O’Groats to Land’s End, generously sponsored by friends, family and all those who want to support St Ann’s. You can follow their progress — live! – at their blog, Lucy and Paul’s Big Ride. As I write, Google Latitude shows them just south of Penrith. Posts from the last few days describe pelting rain all day and steep climbs through the Scottish mountains — let’s hope they’re getting some Lake District sunshine at the moment. At the time of writing, Paul and Lucy have already raised an amazing £6,435 for St Ann’s Hospice. You can support them at their JustGiving page. Paul and Lucy at the summit of the Pass of Glen Coe — phew. Photo by patthecat. Paul and Lucy raised a total of £7,850.00 for the St Ann's Hospice during this charity mission. Thank you!